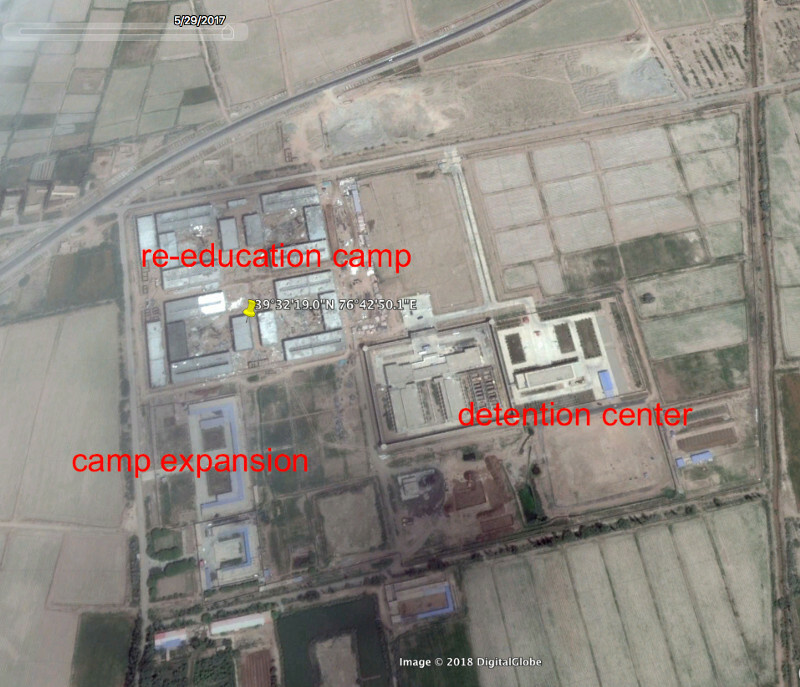 More proof has emerged confirming that China has erected expansive 're-education centers' for up to a million or more ethnic Uighurs in what a recent United Nations statement said resembles a “massive internment camp that is shrouded in secrecy”. The minority Turkic speaking ethno-religious group concentrated in the western Chinese province of Xinjiang has found itself under increased persecution and oversight by Chinese authorities of late as their mostly Sunni Islamic identity and separatist politics have resulted in historic tensions with the Communist government. 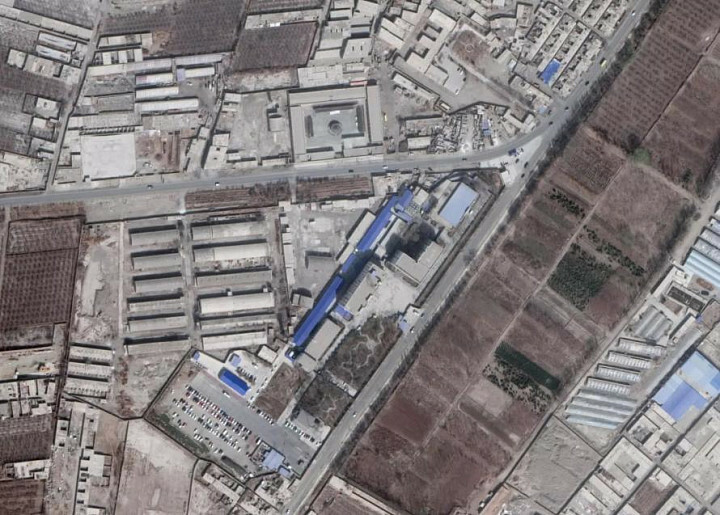 A U.N. panel examining human rights inside China wrapped up last week and included a Chinese delegation of about 50 officials which formally denied that prisons have been set up for the Uighur population. However, a senior Chinese official, Hu Lianhe of the United Front Work Department, for the first time acknowledged the existence of Uighur-focused facilities in response to the U.N. panel, claiming according to the WSJ that they were actually "vocational training centers" and that no "arbitrary detention" was taking place. 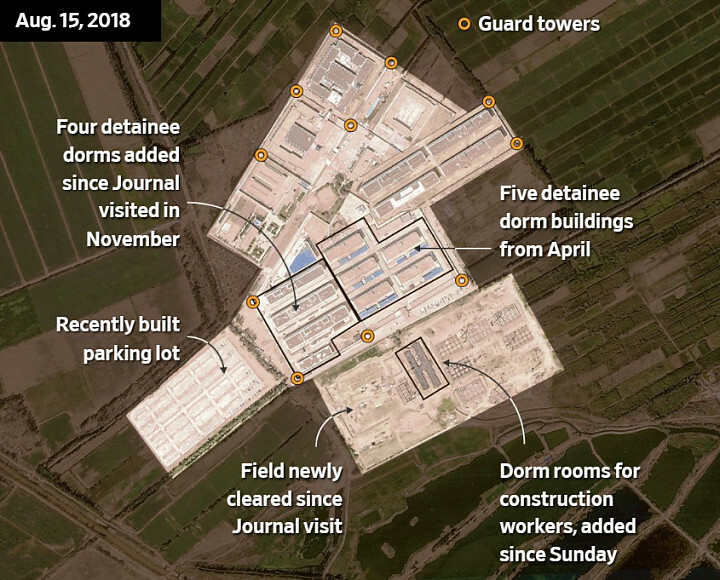 But the WSJ has gathered satellite imagery showing guard towers and other security measures, as well as testimony that contradicts the claim of mere "vocational" programs — evidence which goes so far as to demonstrate that China was constructing camps even as the U.N. rights panel was preparing to convene. Top above shows a camp near Kashgar, China on April 17, 2017 according to the WSJ. The Uyghur American Association via Buzzfeed: "A satellite photo of a Chinese reeducation camp near Korla city in central Xinjiang. GPS coordinates were provided by a Uighur exile who had visited the camp." 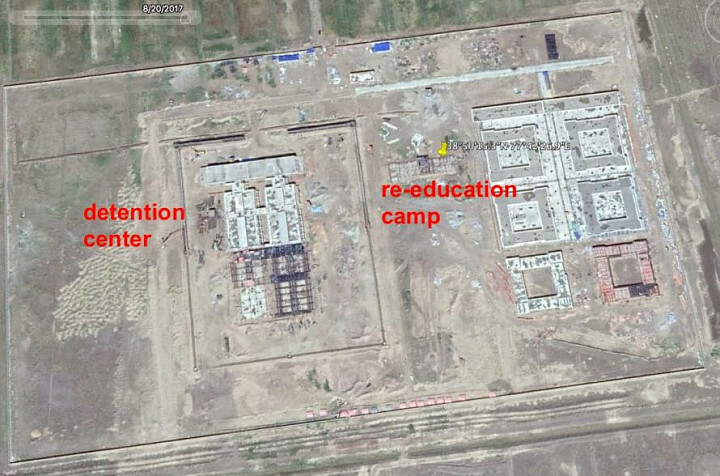 Satellite image of a re-education camp in Makit, Xinjiang (above). 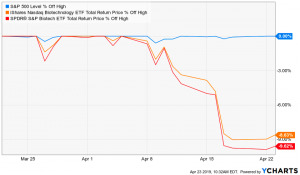 Source: Shawn Zhang via Medium. A satellite image of a re-education camp in Payzawat, Xinjiang (above). Source: Shawn Zhang via Medium. 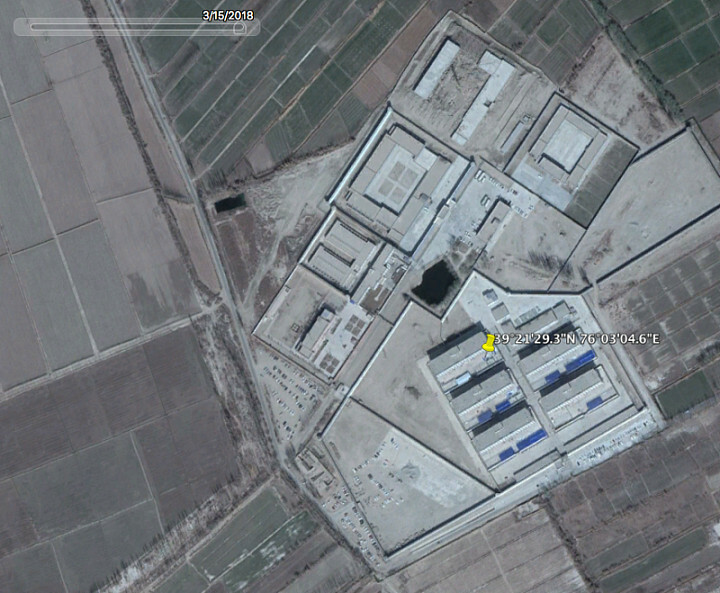 Another view of the Shule camp near Kashgar, China which the WSJ profiled as part of its investigation. Image source: Shawn Zhang, Mediu. 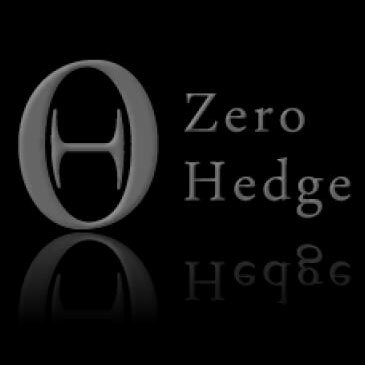 Historically throughout parts of the 20th century, the strict Islamic strand of Wahhabi thought and practice has made deep inroads among the Uighurs, with a number of recent historical analysis papers documenting an uptick in Saudi money and influence in Xinjiang province in the 1990s — something which flies in the face of China's official Communist party and ideology. 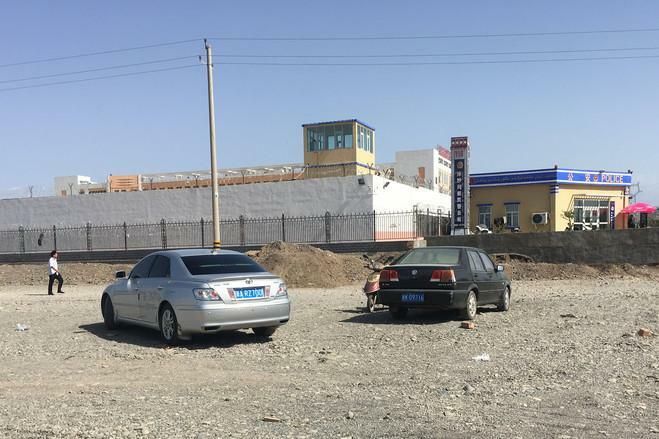 Meanwhile, the WSJ interviewed a number of former inmates at the camps, for example, a 22-year old Uigher only identified as Ablikim: “They would also tell us about religion, saying there is no such thing as religion, why do you believe in religion, there is no God,” he said. Ablikim said he was questioned there for days, spending up to nine hours at a time bound to a chair by his ankles and hands, which were handcuffed behind his back. Interrogators wanted to know whether he was involved with religious groups abroad. He said he wasn’t. He was eventually permitted to join other inmates. The prisoners were awakened at 5 a.m. each morning and after a 45-minute run, shouting “The Communist Party is good!” were fed thin soup and steamed bread, he said. Beijing has in recent years been accused of practicing collective punishment and broad crackdowns on the Uighur population in Xinjiang, which is numbered in total at 11 million (with some estimates of up to 15 million; China's total Muslim population is at about 21 million). The minority ethnic group is also found in sizable numbers in neighboring Kazakhstan, Uzbekistan, Kyrgyzstan. China considers the foreign association and roots of the sizable ethnic group to pose a threat for the importation of terrorist ideology. For example, the most notable separatist movement in Western China is the ethnic Uighur-founded and led East Turkistan Islamic Movement (ETIM, also commonly called the Turkestan Islamic Party, or TIP), a Muslim separatist group based Xinjiang known to have conducted dozens of terror attacks in Chinese cities like Shanghai and Yunnan, but also in places like Afghanistan, and as far as Syria, where it's believed up to 5,000 Uighurs fight alongside al-Qaeda.